With the reappearance of Sarah Palin on the political scene, it seemed inevitable that Tina Fey would also return to reprise her impersonation of the former Alaska governor and Vice Presidential candidate on Saturday Night Live. And sure enough, SNL devoted its cold open–the most privileged slot of the show–to a parody of Palin’s Donald Trump endorsement. And the sketch did not disappoint. Fey captured Palin’s rambling syntax, mocked her use of alliteration and rhyming and her simplistic framing of world issues. In Political TV, I made the argument that most of SNL’s presidential impersonations have only limited satirical effect. In most cases, these imitations simply exaggerate a personality trait–Gerald Ford’s clumsiness, Bill Clinton’s appetites, George W. Bush’s folksiness–without speaking to the political implications associated with them. The exception, to my mind, has been Fey’s imitation of Palin, which helped to tease out the political cynicism that brought her into prominence and how that allowed someone who was clearly unprepared for national office to appear as a VP candidate. This observation became especially acute when Fey’s Palin appeared in sketches alongside of Hillary Clinton, as played by Amy Poehler. While Kate McKinnon has played Clinton as fragile and out-of-touch, Poehler brought a layer of sympathy to her portrayal of Clinton, depicting her as an accomplished whose candidacy was trivialized by Palin’s ascendancy. Together, Fey and Poehler brought a subtly feminist critique to the show. Fey’s reappearance tends to go for straightforward mockery, and her impression of Palin here almost feels like a “greatest hits” performance, capturing Palin’s glib speaking style. But what struck me about this sketch is how it frames our encounter with Palin through the eyes of Donald Trump (as played by Darrell Hammond). 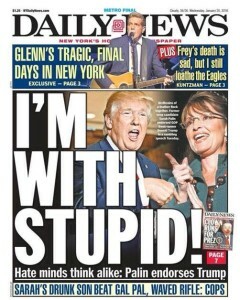 In many ways, it invites us to sympathize with Trump and to see him as being in on the joke (that Palin is crazy). I’m searching for a way in which the sketch might be critical of Trump, but as Hammond plays him, Trump seems to be a goofy guy who’s bemused by Palin’s theatrics. In that sense, it almost works against the 2008 sketches and the feminist critique they articulated. On Wednesday, former Vice Presidential candidate, Sarah Palin, endorsed Donald Trump for President in a speech in Ames, Iowa, home of the Iowa caucuses. From one perspective, her speech appeared to be an incoherent collection of conservative catch-phrases, seemingly jumping from topic to topic without any overarching message. 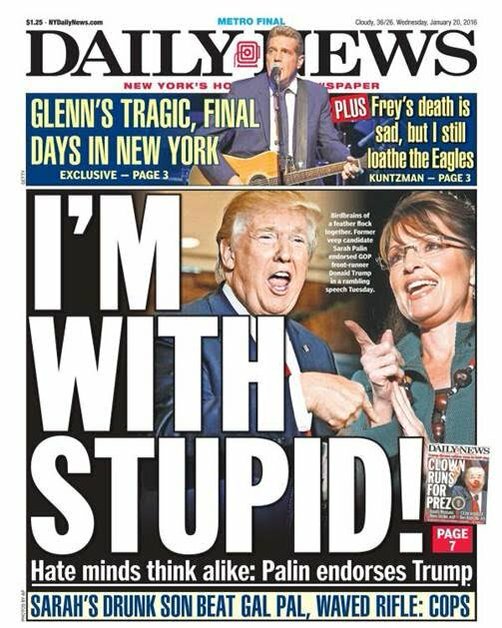 Palin’s rambling comments immediately incited snarky responses from all of the usual suspects–The Daily Show, Stephen Colbert, and the increasingly partisan New York Daily News–much of it quite funny. But as Amanda Marcotte points out, in one of the strongest analyses of the speech I’ve encountered, Palin was neither “drunk” nor “stupid.” Instead, Palin is appealing to what might be called the “affective politics” of contemporary conservative populism. She is speaking to the felt sense of bitterness that Trump’s supporters have about their economic standing, the perception that the Washington establishment–in cooperation with the mainstream media and other powerful institutions–has left them behind. Note that from the very beginning of the speech, Palin refers to hard-working families who are losing ground economically while seeing their religious values assaulted (her reference to “holy rollin'”) in a shift toward political correctness–one of the chief villains in Trump’s political narrative. In much the same way that politicians allude to or echo past political speeches, Palin rhythmically (I hesitate to say “poetically”) frames her audience as “right wingin’, bitter clingin’, proud clingers of our guns, our God, and our religions,” a reference to an oft-cited 2008 interview in which Obama attempted to diagnose why midwestern voters were reluctant to embrace him.